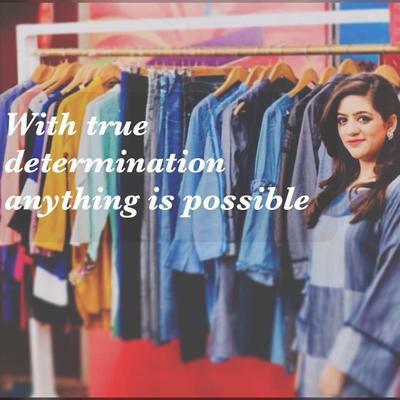 Misha's Collection is a designer clothing brand offering a wide range of Pakistani outfits - partywear, bridalwear,kurtis,tunics, stitched apparel and unstitched material for women's wear for all occasions. A. I am strong independent women of today who wants to make a difference in the society through standing on her own feet. Q. How did you get here and how long have you been in this profession (or been doing what you do)? A. A lot of hardships, various experiences (including failures) and determination led to where MISHA’S stands today. Q. What has been your vision and what do you most love about your work? A. To cater all sectors of women, be it the working class or homemakers. When I see people wearing my designs, created so passionately by me, is something I love about my work. Q. What do you think is your biggest achievement throughout your professional journey? A. Being presented on National Television has been one of the biggest achievements of MISHA’S so far. Q. What are your current projects and what do you plan on doing in the near future? A. Just launched spring summer collection and also working on the upcoming Ramadan & Eid season. Q. A word of advice you would like to pass on to other women struggling with their start-ups? A. Be passionate and persistent and never be afraid to take risks. Return to Apparel and Fashion.